Brrrrrr, baby it's cold outside! Well, it is winter, the festive holiday season, and temperatures have dropped. 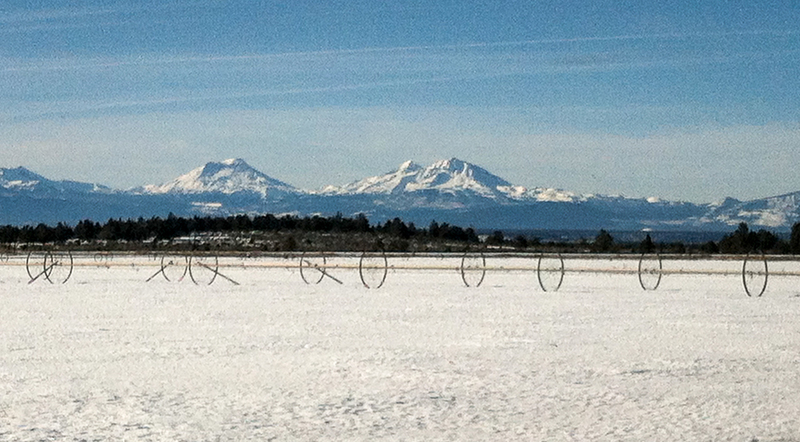 Snow is predicted over the weekend and skiers are ecstatic. But who needs an excuse to enjoy mug after mug of Glogg (hot mulled wine)? It can be served hot or cold, though the warm version is traditional, a celebratory beverage to warm both body and soul. Glogg smells divine and tastes even better; a potent, comforting drink that can deliver a kick... or more likely make me sleepy after several mugfuls. 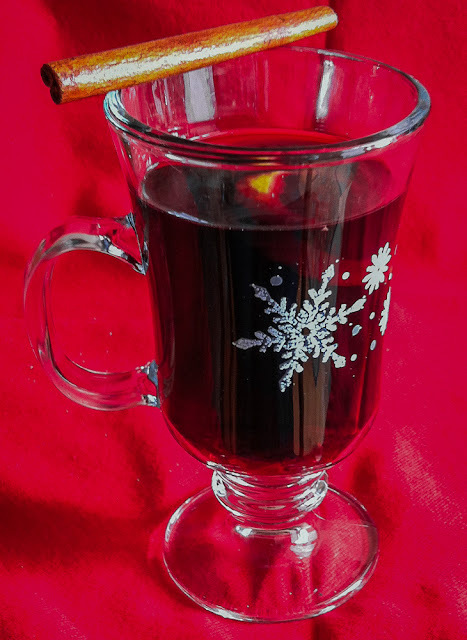 Whether you call it Nordic Glogg, German Gluhwein, Canadian Caribou, UK Wassail, or hot wine in a variety of languages, you will find recipes for mulled wine vary greatly, even within cultures. 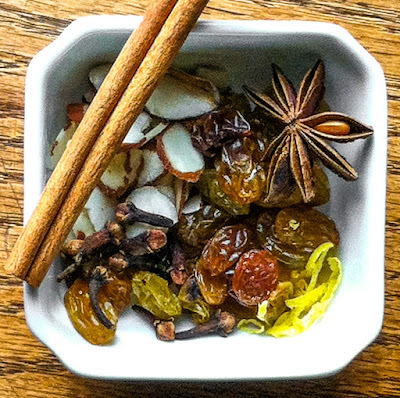 Typically the main ingredients include red wine, sugar, spices such as cinnamon, cardamom, ginger and cloves plus citrus and occasionally brandy. Potent, indeed. No time to create your own mixture? Retailers can supply premixed mulling spice blends, Glogg concentrate or even bottles of already prepared Glogg. Myself, I'll go with easy-to-prepare homemade Holiday Glogg and serve it in honor of the New Year, and to salute the memory of a wonderful holiday visit in snowy Central Oregon earlier this week. 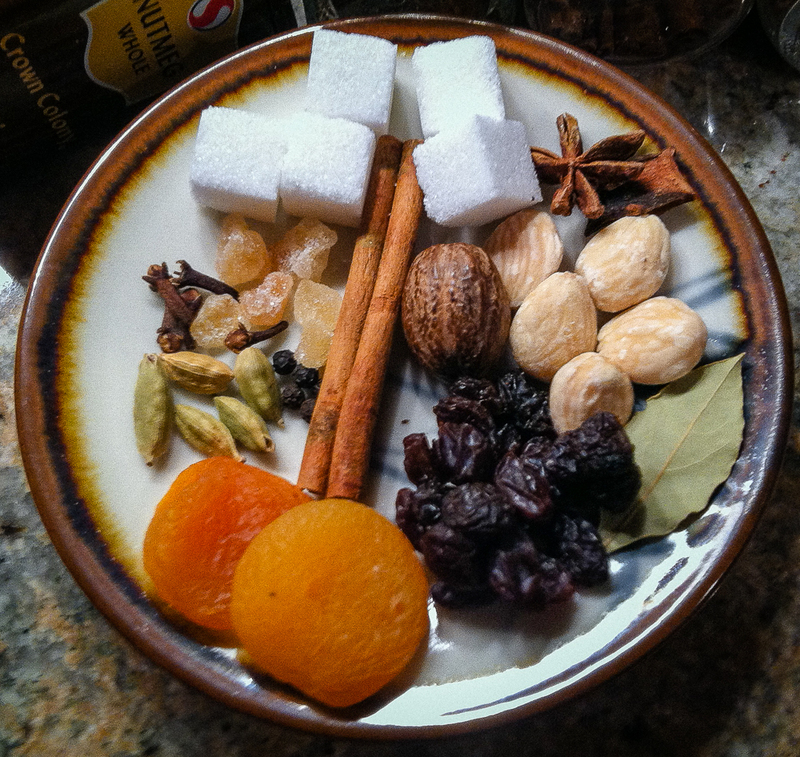 Try this tasty beverage, perhaps play around with the spice mix ingredients to create your own flavor blend. Here's the recipe from my latest batch of Holiday Glogg. Enjoy, and Happy New Year! Simmer all ingredients except sugar cubes and garnish, covered, in a nonreactive saucepan for 30 minutes. Be careful not to boil the mix. Strain to remove the solids. (You might want to keep the nuts and fruit to use in baked goods.) 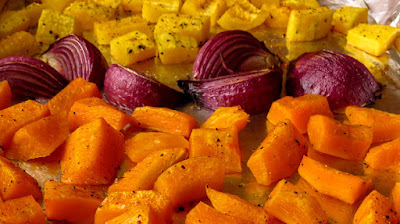 Cool and refrigerate for several hours or overnight. 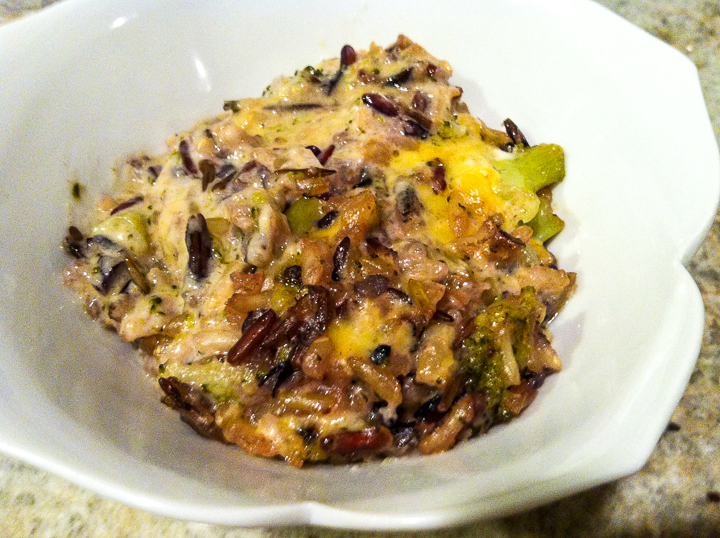 To serve, reheat the mixture over low heat (do not boil!). 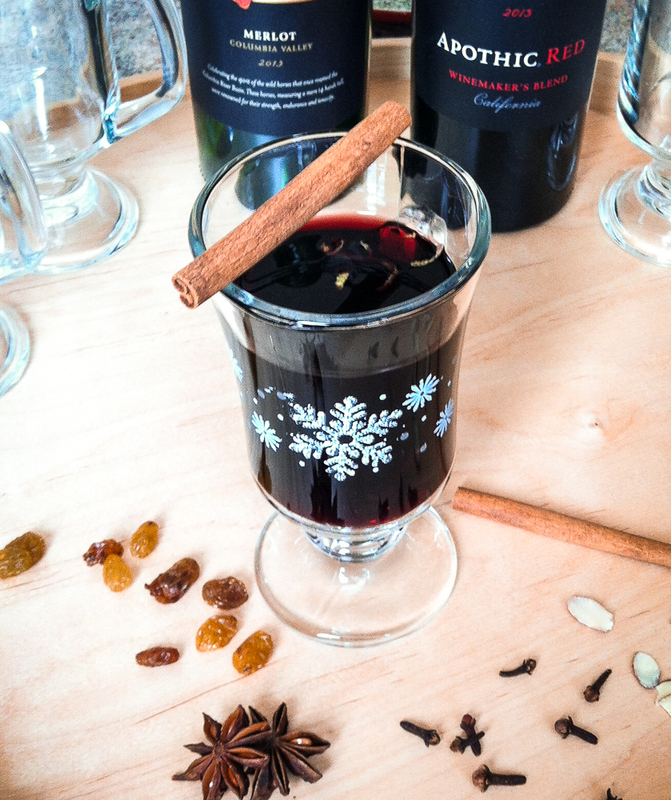 Serve Glogg in a warmed glass over a sugar cube or two. Garnish with a cinnamon stick and an orange slice or twist. * Add 1/4 cup rum, brandy and/or port to the heated mixture after straining. * Make a double batch to enjoy some immediately and bottle the rest to serve later in the season. It mellows and blends the flavors, improving with age. Refrigerate to hold. Just one bite of creamy, lemony hummus, warmed and topped with fragrant, flavorful lamb offers up a taste that whispers 'comfort food' in any language. Add some warm pita bread for scooping and you have an awesome appetizer or supper option. 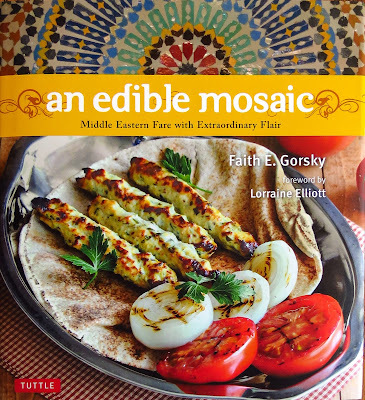 There are many more complicated recipes for Hummus and Lamb Kwarma available online (David Lebovitz posted this one recently), but I adapted a simple version found in a favorite Middle Eastern cookbook, An Edible Mosaic by Faith Gorsky. Faith's recipes reflect Syrian family recipes and a wealth of eating experiences in the Middle East, translating it for home cooks everywhere. 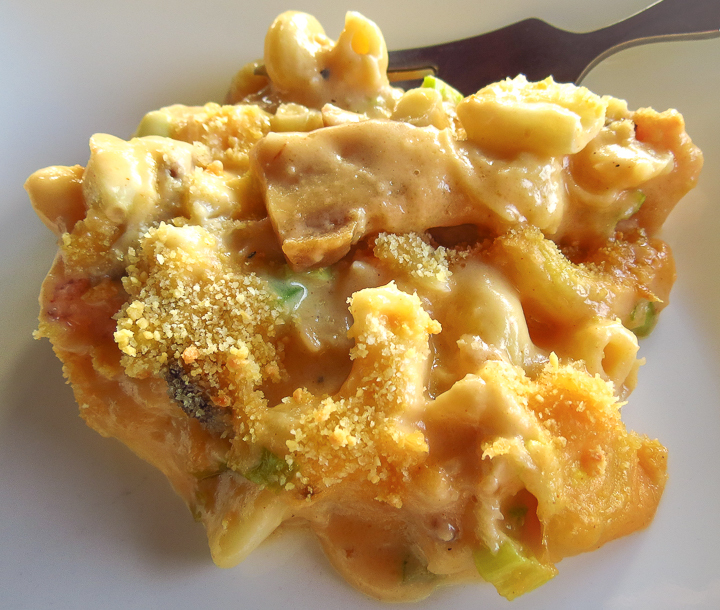 My pantry held all of the required ingredients, ordinary items, but the combination was deliciously unique. 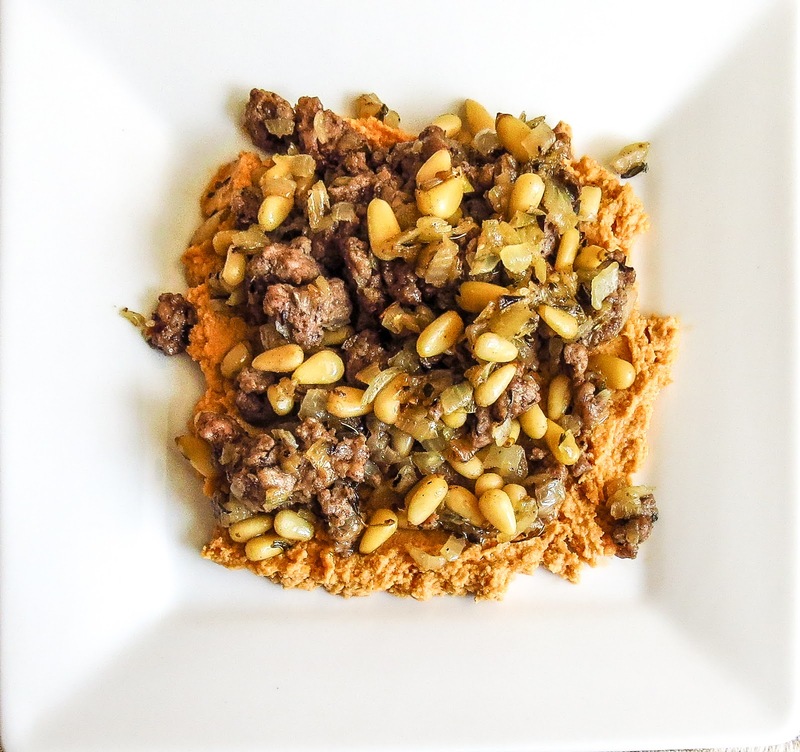 Use your favorite hummus recipe if you like, but try it warmed and topped with this crunchy, spicy ground lamb. The resulting dish might tempt you to play with the seasonings and toppings to suit your own taste. Mmmmmm, with some added lemon zest and flat-leaf parsley, maybe a splash or two of harissa, this dish will definitely make more appearances in my kitchen and galley. Prepare & set aside, ready to warm in the microwave before use. Use a food processor to puree the chickpeas, tahini paste, lemon juice, garlic, olive oil and a few tablespoons of the cooking liquid. Aim for a medium-thick spread, adding more or less liquid one tablespoon at a time as required. Stir in the cumin, paprika, salt and white pepper. Taste and adjust seasonings as needed. 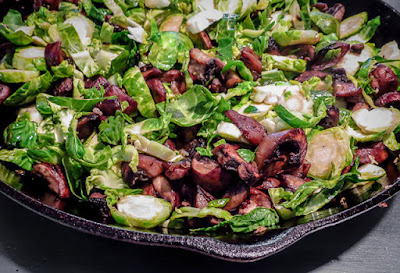 Heat the olive oil in a medium skillet over medium heat; add the onion and sauté until it begins to soften, about 3 to 5 minutes, stirring occasionally. Add the ground lamb, salt, spices and pepper. Raise the heat to high; cook until meat is fully browned and the onion is tender, about 3 to 5 minutes, stirring occasionally. Stir in the pine nuts and cook 2 minutes more, stirring occasionally. Warm the prepared hummus in the microwave; spoon onto a platter or bowl. Use the spoon to create a slight depression in the middle of the hummus. Pour the lamb on top of the warmed hummus. 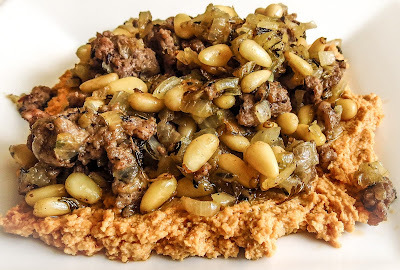 Sprinkle with more pine nuts, if desired, and serve with warmed pita bread wedges for scooping. Note: hummus and spiced lamb can be prepared ahead and held in the refrigerator for several days. Warm each before serving. Here's the recipe for today's warming bowl of soup, some comfort food to welcome the 2016 Winter Solstice on December 21, a day when the sun reaches its most southerly declination. This is the shortest day and longest night of the year in the northern hemisphere. In Seattle solstice daylight measures 8 hours, 25 minutes and 25 seconds between sunrise and sunset. I mistakenly thought solstice had already arrived on several dark, dreary days earlier this month, times when the clouds covered the sun for the entire day. And today, the shortest day of the year, the sun shone all day. Go figure! "Across the world in Mexico's Yucatan Peninsula, the ancient stonewalled city Mayan city of Tulum also has a structure honoring the solstices. When the sun rises on the winter (and the summer) solstice, its rays shine through a small hole at the top of one of the stone buildings, which creates a starburst effect. "It is thought that the winter solstice was actually more important to the people who constructed Stonehenge than the summer solstice. The winter solstice was a time when most cattle were slaughtered (so they would not have to be fed during the winter) and the majority of wine and beer was finally fermented. With no cattle to slaughter and a total lack of homebrew to sample, I'll honor the Winter Solstice with a bowl of soup, some comfort food to warm the tummy and recognize the shortened daylight hours. I'll also celebrate the fact that from now on the days will grow longer, minute by minute, until we reach the summer solstice with its promise of maximum light. Sigh, my inner California girl is so ready for more hours of sunshine! This cheese soup is not showstoppingly pretty, not even close, but it does pack a delicious flavor punch. 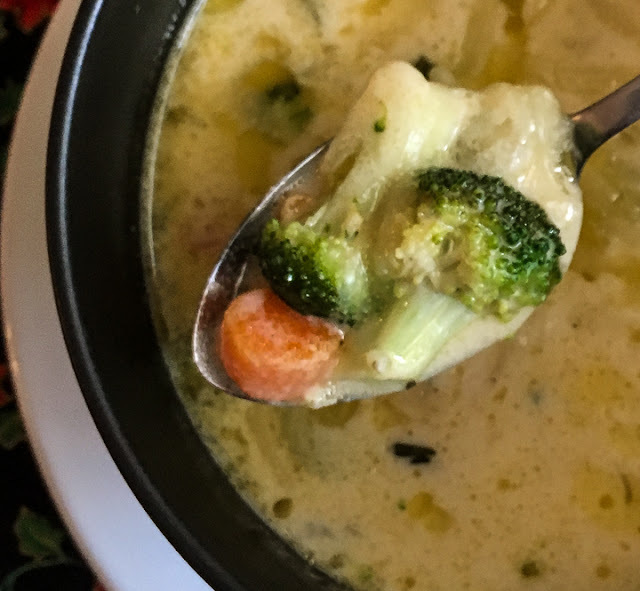 Think cheese fondue studded with healthy vegetables and you're close. Version 1 of the recipe came from the Vincent Price cookbook, A Treasury of Great Recipes. Price's recipe for Vermont Cheese Soup strained the vegetables (leeks, celery & onions) out of the broth to produce a silky liquid base for melting the cheese. I added carrots to the mix in Version 2 and did not strain out the vegetables. 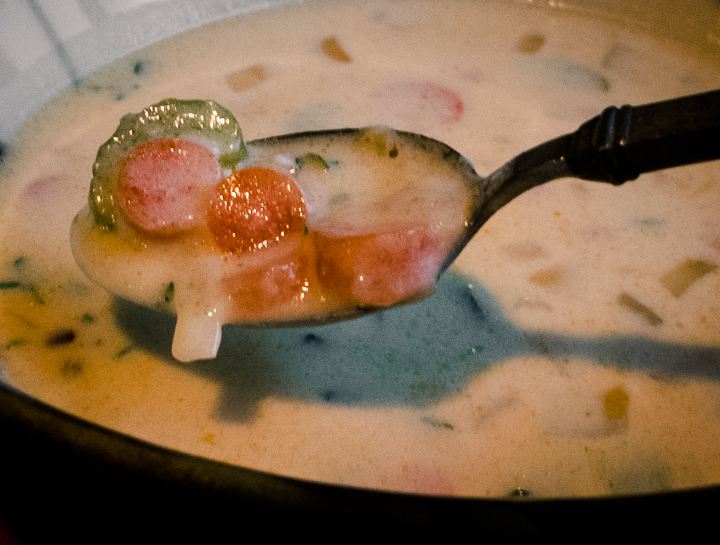 This produced a more casual, rustic soup, somewhat heartier than Price's refined, suitable-for-company presentation. In Version 3 cauliflower and broccoli florets, minced garlic and fresh thyme joined the party. I tinkered with the process, played with the seasonings, and voila! we have a new current favorite. Here's the 2016 version of Cheese Soup with Vegetables from my galley. Melt the butter in a heavy-bottomed Dutch oven over medium heat. Add leeks & onions; stir occasionally & cook until softened. Add the garlic, celery, carrots, cauliflower & broccoli; cook for a minute or two until garlic is fragrant. Sprinkle the flour, pepper & nutmeg over the vegetables and stir to coat. Cook until the mixture just begins to brown. Whisk in the chicken broth & cream. 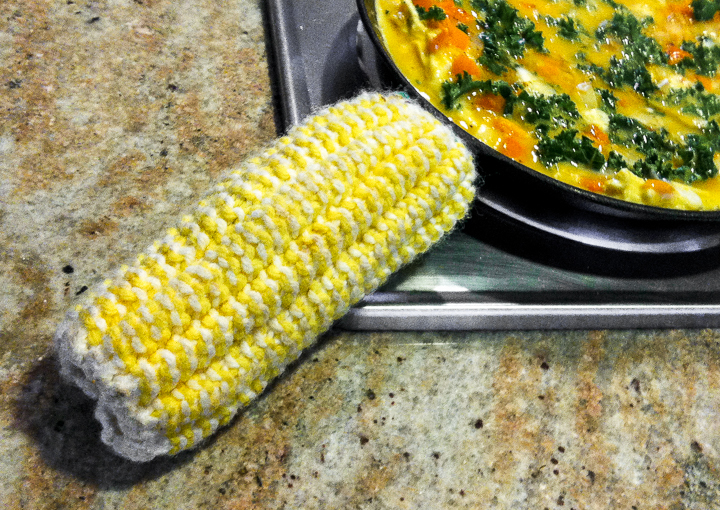 Bring the mixture to a boil over medium-high heat; reduce heat and simmer until vegetables soften to desired texture. Move the pot off the heat & stir in the hot sauce and vermouth. Let the soup cool slightly to avoid curdling when you add the cheese. Slowly add the shredded cheddar and jack cheese, whisking until the cheese melts. Taste and adjust seasonings as necessary. Sprinkle with fresh thyme leaves and serve immediately. Note: to hold and reheat, remember to use low heat. DO NOT let it boil or it will separate. I guarantee it. The soup will taste the same, but look... unlovely. 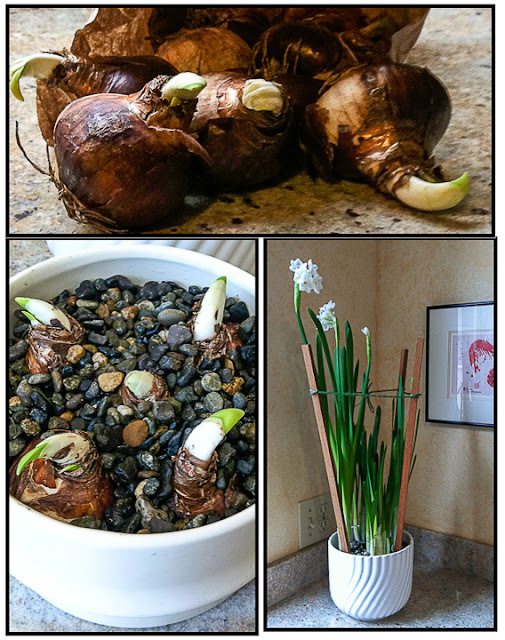 The kitchen window bay and an adjacent counter hold pots of blooming paperwhites (narcissus). 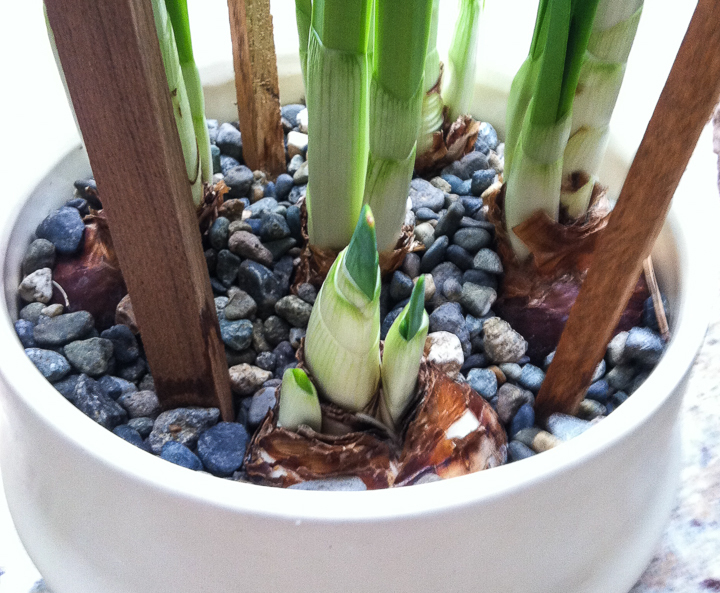 Planted just prior to Halloween the bulbs were intended to bloom for Thanksgiving, but waited instead until days after the holiday had passed. Now we have scads of blossoming narcissi, all but the one stubborn bulb that sits, still sulking, hunkered down in the pot full of gravel. Is it waiting to celebrate the new year instead? 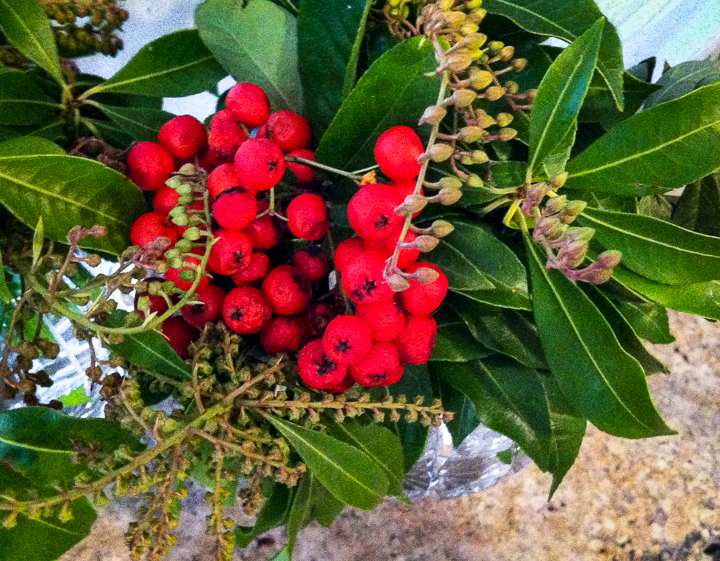 No matter, as other fragrant blooms now perfume the air with their pungent aroma for pre-Christmas enjoyment. I love the scent, but have read that others find it horribly objectionable (link). Hmmm, I imagine Paperwhite scented perfumes must elicit interesting responses at some crowded venues. 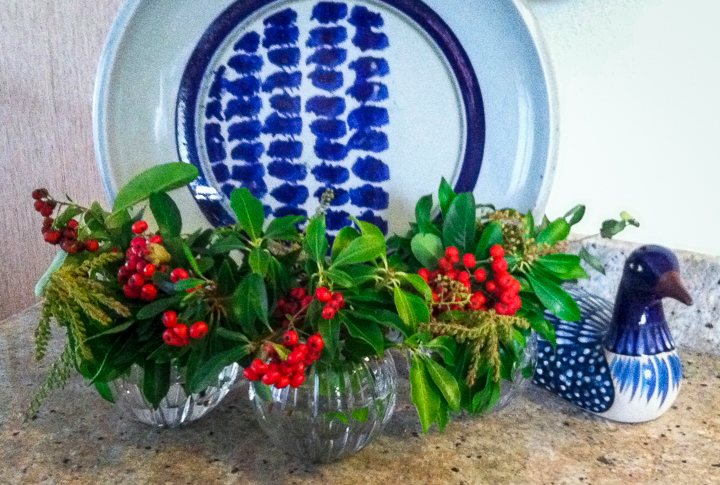 Pyracantha berries clipped from plants in the yard decorated the Thanksgiving table and continue to add color to the winter kitchen. On dreary, gray days I especially appreciate these little pops of color. Speaking of color pops, check out these vivid Poppy silicone pot lids. They are functional and gorgeous, newly purchased online at Amazon on a whim after seeing the green, lilypad covers posted by Liz last month. More and more red items find their way into my kitchen each year. This purple spoon holder doesn't have a color match anywhere in the kitchen, but it does add whimsical functionality along with a bit of color. Three cheers for silicone gadgetry. Another cute little tool, newly added to the gadget stash, has already seen useful action dusting sourdough loaves with flour and adding showers of powdered sugar to breakfast crepes. It is tiny but mighty... ok, mighty useful as a one-handed device that is tidier than using a small strainer. Gadget love continues. November's shipment of fresh spices prompted reorganization of the spice cabinet. This time I remembered to date each jar; a useful habit to see which spices get heavy use and spot any old, underused spices that should just be discarded, certainly not replaced. 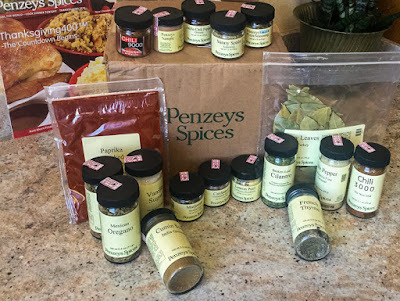 Keeping track of spices afloat and ashore is an ongoing issue. This year it was hard to find tarragon, fresh or dried, in local groceries - what's up with that? Years ago Mom knit several corn cob potholders for my cast iron skillets. The yarn has faded, the potholders grown stained and worn with use, but I'm still fond of them. I could find a pattern and knit a few more, but replacements wouldn't hold the Mom connection. It might be time to switch to more practical silicone handle covers. Only fresh fruits, no baked goods, made the dessert list during that week; no surprise there as savory tends to win out over sweets when I cook what I like. But now it's full speed ahead into holiday mode and there will be baking in my kitchen this month. C'mon by any time for a sweet treat and a visit. 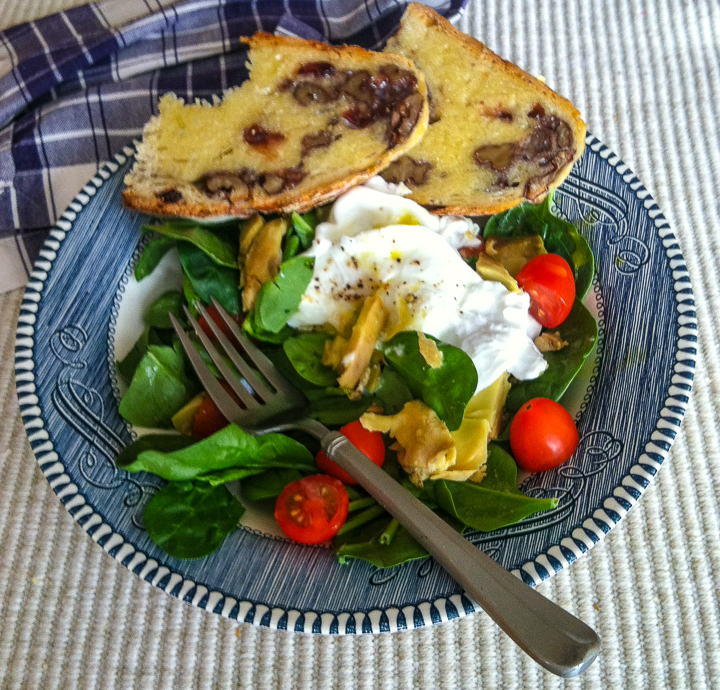 Meanwhile, visit BizzyLizzysGoodThings to enjoy a peek into other kitchens around the world. The accomplished Lizzy (Australian writer, cook & traveler) hosts this fun IMK gathering each month.